Live Long, Live Long Return, Prosper, Prosper Return, POLR (Path of Least Resistance) and POLR Return are single track bicycle/pedestrian trails in the Big Slough Preserve. They are easily accessible from the Myakkahatchee Creek Environmental Park. There are 52 miles of doubletrack and 13.5 miles of singletrack in the 4474 acre preserve. 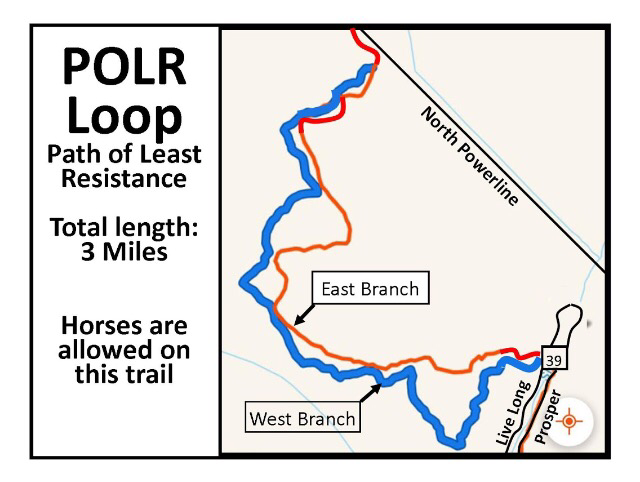 POLR in conjunction with POLR Return is now a 3.5 mile loop. POLR is short for "Path of Least Resistance". It was originally built after searching for the easiest buildable route between the North Powerline (TM 122) and the north end of Big Slough (TM139).